I guess this question arises, in almost every food blogger. My hubs started complaining. I don’t deny that he is the one behind my blog with constant encouragement, my best critic and adviser. But at times when lunch or dinner is ready, and I jump upstairs with my dishes and props, saying “Just a min hon, I will be just right back, I need to take a picture”, he gets upset. He says you are cooking just because of blogging. Hmm… well… what can I say? My last post was 6 days back, and every day I was thinking about something special to cook so that I can post again. Does every one have the question “What to post next?” hovering in your mind all time? or is it just me? Coming to the recipe, when I went grocery shopping the other day to buy chicken, I had some other recipe in mind. But I could’nt get all the ingredients. 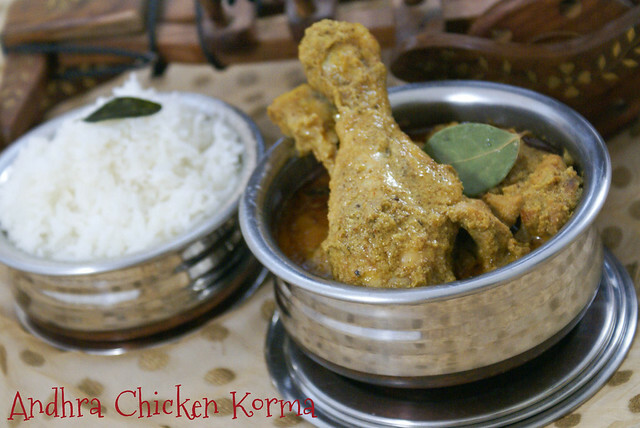 So I made this simple Chicken Korma my grandma used to make when we were kids. Heat oil in a wide thick bottomed pan. Add Jeera and curry leaves. Add onions and fry till the sides turn brown. Add green chillies and ginger garlic paste. Fry for 3 to 4 mins. Add turmeric and red chilli powder. Fry for 2 more mins. Add poppy seeds and coconut paste. Fry till it emits nice aroma. Add the prepared masala powder. Mix well. Add the chicken pieces. Cook on high without lid, till chicken pieces turn white. Add 1 cup of water or chicken stock. Cover and reduce heat to low. Cook for around 15 to 20 mins, or till done. Add lemon juice and adjust salt. Serve hot with Steamed Rice or Dosa or Garelu/Vada. Wowo that kurma looks super super delicious. Korma looks delicious! I remember even my grandma & mom using poppy seeds few years back and nowadays everyone has stopped using it. I do add it occasionally when I am bored of the chicken curry I make, without poppy seeds. I could relate to every thing you said! Sometimes when the photos doesn't come out right .. i keep clicking and food gets cold and worst is when I make that dish again just for photo 🙂 This is looking so yum and chicken legs are my fav anytime. 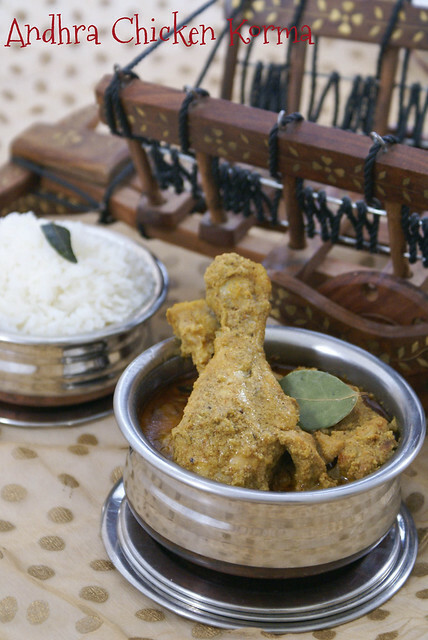 Omg, makes me hungry,cant take my eyes from ur fabulous clicks..
Yeah, the pic taking thing does get the family riled sometimes..and it is so funny – my 8 year old keeps asking me why I'm not taking pics of some dishes..loved that chicken kurma. So much flavor, it looks really tasty! first time to your space..
very lively presentation with great clicks..
hiii,while gooking and preparing for phot even i have the same question in my mind.nice blog.keep posting. Very nice sounding korma recipe, thanks so much, look forward to trying. 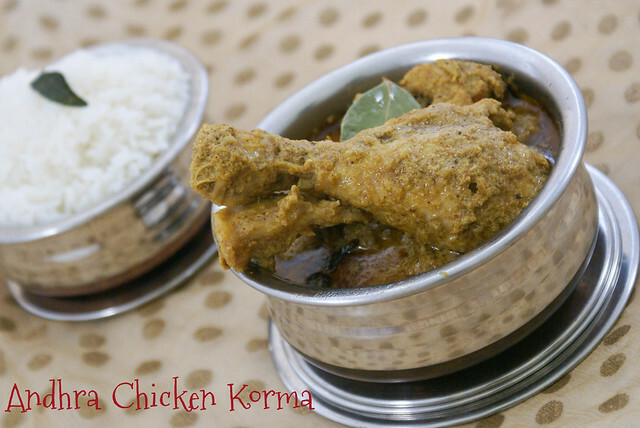 Chicken Korma from Andhra is truly delicious and spicy. Mmmmm, this is getting me hungry!